BMW’s M division has marked the 30th anniversary of the M5 with the unveiling of the most powerful version of the iconic four-door saloon yet. Set to be produced in a limited run of 300, the BMW M5 ’30 Jahre M5′ (30 years of the M5) builds on the performance gains of the recently introduced M5 Competition Pack. It consequently gets a lightly reworked version of BMW M division’s twin-turbocharged 4.4-litre V8 direct-injection petrol engine delivering an added 25bhp, at 592bhp. This provides the 1870kg four-door with a power-to-weight ratio that is 14bhp per tonne up on the M5 Competition Pack, at 317bhp per tonne. Torque has also risen by 15lb ft, swelling to a new peak of 516lb ft on a band of revs between 1500rpm and 6000rpm. The increase in reserves has been achieved through what BMW M division development boss Albert Biermann described as “tweaks to the engine management system and an increase in the turbocharger boost pressure”. Drive is channelled to the rear wheels through a lightly reworked version of the standard M5’s seven-speed dual-clutch automatic gearbox, which boasts new software mapping. 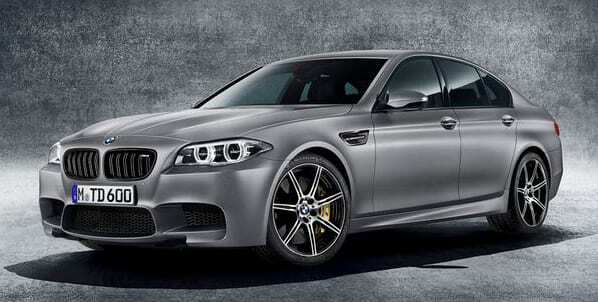 The result is the fastest series production M5 ever. BMW claims 0-62mph in just 3.9sec and a top speed that is limited to 199mph in combination with an optional M Driver’s Package. Combined cycle fuel consumption is a claimed 28.5mpg and its CO2 emissions are rated at 231g/km. Underpinning the new M5 30 Jahre is a chassis featuring the same subtle modifications incorporated on the M5 Competition Package, with firmer springs and dampers, a 10mm reduction in ride height and standard 20-inch wheels shod with 265/40 front and 295/40 rear tyres. Other changes include more direct mapping for the electro-mechanical steering system, a separate control unit for the active M differential for faster reactions and a recalibrated dynamic stability control (DSC) system. The M5 30 Jahre is further distinguished from the standard M5 by a matt silver metallic body colour, darkened chrome accents for the kidney grille surround, door handle inserts and tailpipes and ’30 Jahre’ badges within the front wings.